I made this for dinner on Monday night, and it was so delicious I forgot to take a picture! A perfect spring dinner. This recipe is very customizable, so feel free to add lots of other veggies to this. I think it would be especially delicious with asparagus, green beans, and/or mushrooms. Cook pasta according to package directions in heavily salted boiling water. Meanwhile, heat oil in a large, deep skillet over medium-high heat. Add onions, garlic, and zucchini to pot and season well with salt and pepper. Saute until tender and slightly browned, about 7-8 minutes. Add peas and the zest of the lemon, cook for another minute. Drain pasta, reserving slightly more than 1 cup of the cooking liquid. 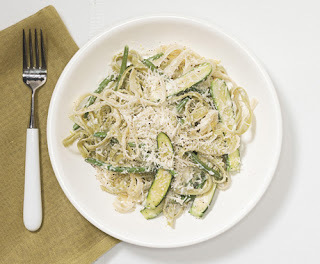 Add pasta to veggies along with cream, cheese, the juice of the lemon, and ¾ cup of the pasta water. Reduce heat to medium and toss until all ingredients are heated through and the cheese has melted to form a sauce. Add more pasta water if the sauce is too thick. Stir in fresh herbs and more salt and pepper, if needed. Serve immediately, passing extra parmesan cheese if desired. I'm making this for dinner tonight 🙂 Smells yummy! This sounds wonderful! This is going on next week's menu. This looks so delicious. Thank you for sharing and you have a Happy New Year! This was a good one — thanks for reminding me of it, and for linking it up. Previous post: Is Classic Library Instruction Outdated?